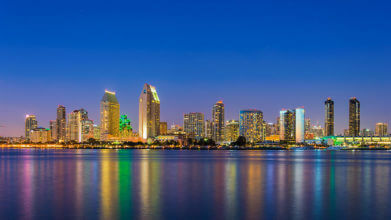 No matter what time of the year you visit, family fun abounds in San Diego. The weather is as close to perfect as it can get, the locals are friendly, and the area is bursting with things to do. Can you say Beach Day? There are 70 miles of coastline in San Diego and miles and miles of magnificent beaches to explore. And whatever kind of beach you’re looking for, San Diego is sure to please. From rocky shores where the waves crash into the cliffs to long stretches of pure white sand and everything in between, you’re sure to find your beach. A great way to experience some of the best beaches in the area is on the Old Town Trolley San Diego Beach Tour. It’s a comfortable open-air trolley car that takes you to four of the top beaches: La Jolla, Mt. Soledad, Mission Beach and Old Town. You can get on the tour at any of the stops and get on and off wherever you wish. While you’re onboard, you’ll be treated to fun stories, great music and a bit of history about the areas you’re visiting. Explore tide pools and coral reefs, play beach volleyball, surf, swim or simply soak in the sun. Walk the boardwalk and have a hot dog at Mission Beach, enjoy the panoramic views of Mt. Soledad, and explore a variety of upscale things to do in La Jolla. It’s an all-day fun-in-the-sun family adventure! Take the Polar Bear Plunge! Hit the San Diego Zoo for a day of animal encounters that will surely awe your children. Located in Balboa Park, the San Diego Zoo has about 4,000 rare and endangered animals of more than 650 species. A totally cool concept, the zoo has open-air, cage-less exhibits that recreate the animal’s habitats. Get up close and personal with the Giant Panda – the San Diego Zoo is the only zoo in the world that has one. There are also elephants, polar bears, giraffes, snow leopards, hippos, bears, cheetahs, giant anteaters, gorillas, kangaroos, koalas, cobras, spiders, poisonous frogs, monkeys and so much more. Your kids will love to roam the scenic trails and pathways of the zoo and there’s also a botanical collection that shows off more than 700,000 exotic plants. There are special events, educational programs and other activities going on throughout the year here as well. The San Diego Zoo is easily the most popular attraction for the entire family to enjoy. Put your hands in the air like you just don’t care! The perfect place to take your kids is Belmont Park. It’s a beach-front amusement park located on Mission Beach and is home to the awesome of awesome rides and thrills for kids and their parents, too. For a quick rush of adrenaline, get your seat on the Giant Dipper Roller Coaster. With its steep hills, sharp curves, high speeds and fast drops, you and your gang will be screaming with joy. The park also has the Beach Blaster swing ride that whooshes you 60 feet in the air and the Octotron that whirls you around just enough to make you giddy with dizziness. There are bumper cars, tilt-a-whirl, the vertical plunge, laser tag and many of the traditional amusement park rides that everyone loves and they’re all overlooking the beautiful beach. Ride, eat, shop and then take a stroll along the beach. There’s so much family fun and it’s all in one place. Load up the crew and head to Old Town Historic Park. You’ll see original adobe houses that date back from the city’s Spanish and Mexican beginning. There are shops, museums and restaurants and you can take a tour to learn about the rich past of San Diego. Costumed volunteers are walking around to share with you information about Old Town and what life was like here in the 1800’s. Be sure to check out The Whaley House; it’s the oldest brick house in Southern California and supposedly one of the most famous haunted homes in the United States. Have the kids keep an eye out for paranormal activity. This is one of the most popular San Diego attractions and offers a lot of fun and history for the entire family. Get out and have fun in San Diego! Outdoor fun is happening in San Diego all year long. Whether you take the Old Town Trolley Beach Tour, visit the San Diego Zoo, ride the coasters at Belmont Park or visit Old Town, you’re sure to create family memories that will last a lifetime.